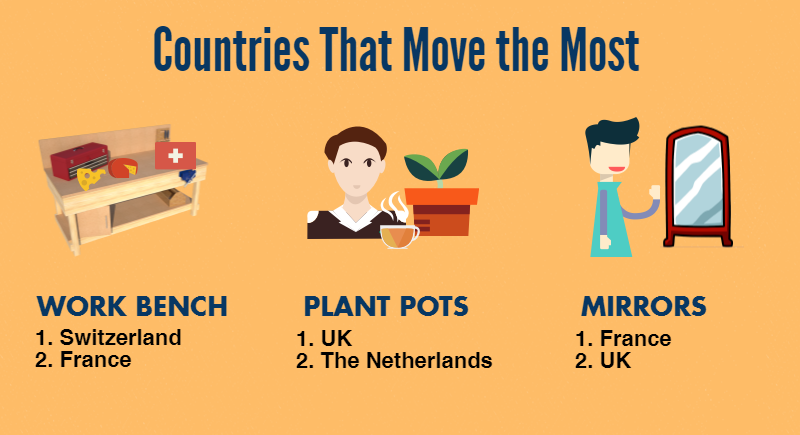 Moving items internationally, are you doing it right? The cost of moving items internationally can be quite high depending on the distance between locations and the volume of your move, so what you take with you when you move to another country, matters greatly. Hence the question above, are you doing this right? Our team aims to highlight the decisions of expats by showing the Top Move Items of 2016 along with some vital information about the volume of moves, all to help expats optimise the cost of moving items abroad. “Our findings have identified a worrying trend for the global mobility function – expats seem to be placing far less thought into practicality during their moves and what items should be left behind. There could be many possible factors driving the average overseas assignee’s tendency to ‘hoard’ their possessions as they move and these could range from a matter of convenience to sentimentality to the desire to fully maximise whatever relocation benefits provided by their companies,” said Sébastien Deschamps, CEO and Founder of ExpatFinder.com. 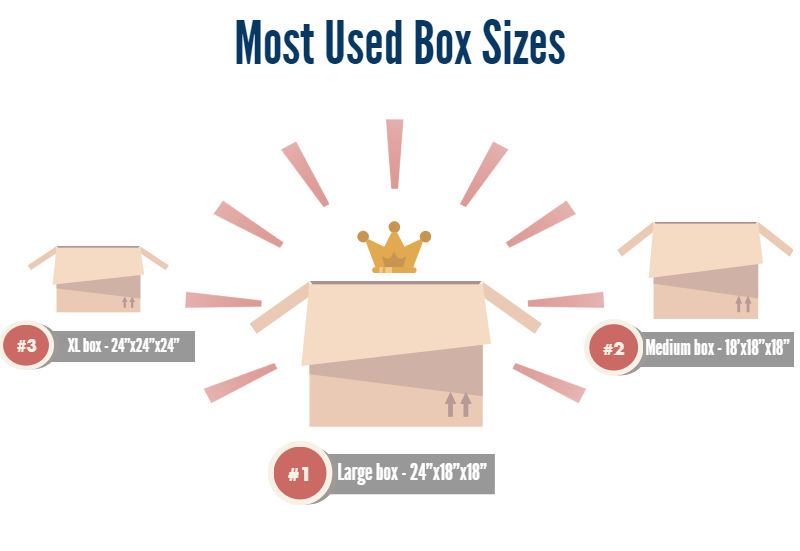 The report also shows that large boxes (24”x18”x18”) are the most used box size, followed by the medium box (18”x18”x18”) and the XL box (24”x24”x24”). This may suggest that expats are still shipping large items which they can otherwise purchase in their host country. One of the most important things to know when you’re packing for your move is if this item is cheaper to ship or to buy brand new in your new country of residence. If you want to be practical with moving, you would have to check the price difference factoring the inconvenience of possible shipment delays and mishandling of items to see if it’s worth it to ship your items or just get a new one. To learn more about shipping costs read our full guide about it here. Once you’ve decided what items you’re definitely going to take with you, you should understand the volume of items, like how much you can fit in certain sizes of containers and how much volume you can fit in different sizes of household. If you want to picture it in a different way, 5 cubic metres can fit 40 medium sized boxes. It might seem like a lot, but when you start packing your items, you can very easily see why this is called the “standard size”.This volume gives you just the right amount of valuables to take in an international move. For bigger moves, there are two frequently used large containers, the 20ft container and the 40 ft container. These are usually used when you’re moving entire households including furniture and even vehicles. 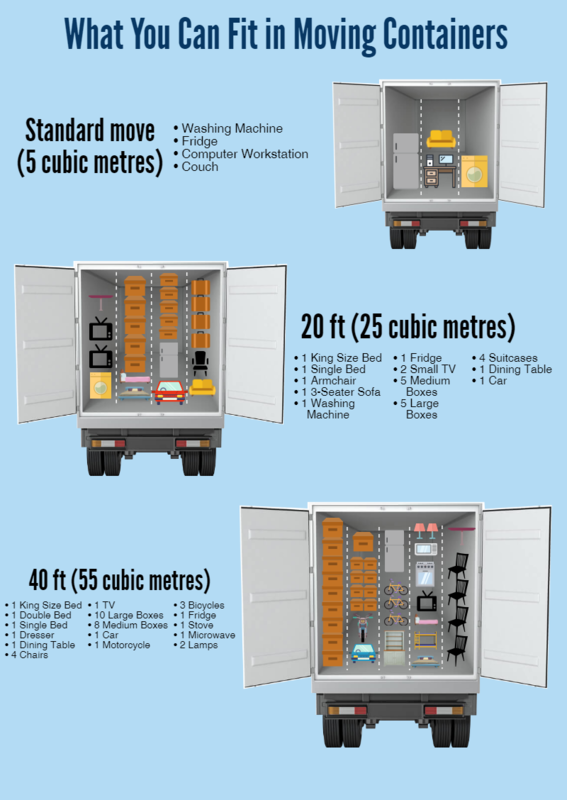 Read more about shipping containers in our full shipping containers guide here. The prices for these move sizes can be different depending on the distance of the move, but they are usually quite expensive. It’s usually recommended if you’re doing a full immigration to a new country or a long-term assignment. 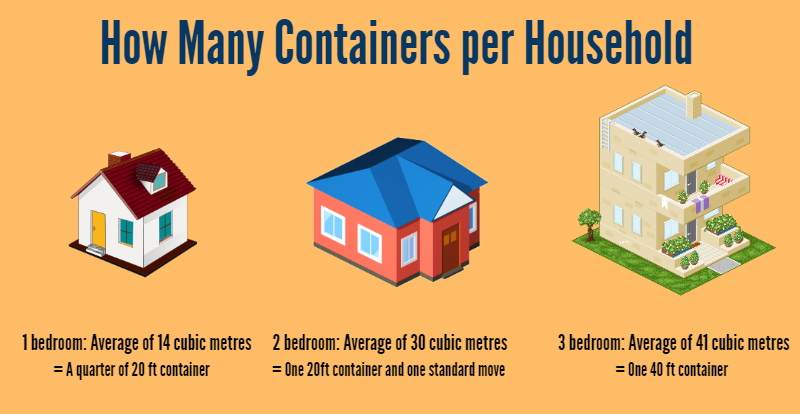 To see how you can use these containers the best when you’re moving, we’ve checked how many containers you need to fill up different sizes of households. As you can see, in most household sizes, you don’t really need such a big container to fill it out, especially because most houses for expats abroad are rented fully furnished, or with furnishings provided by the company through assigned housing. So unless you will move into a bare house and intend to live there for a very long time, it’s not really very advisable to move huge volumes in your new country of residence. There are a number of factors that contribute to why most expats are still not very practical when it comes to moving items. Sentiment is definitely one of the most popular reasons why we take items we want to move. As expats abroad, building a home in a foreign country is important. Taking familiar items or maybe a few things you can’t find anywhere else in the world makes it easier to battle culture shock, and it’s like taking a part of your home country with you. But you have to draw the line if you want to be cost efficient in your move. Consider the length of your assignment, the cost of living in your new country of residence, the cost of moving the items etc. Do your part in making the most out of your move. Read more about efficient packing tips in our guide here. 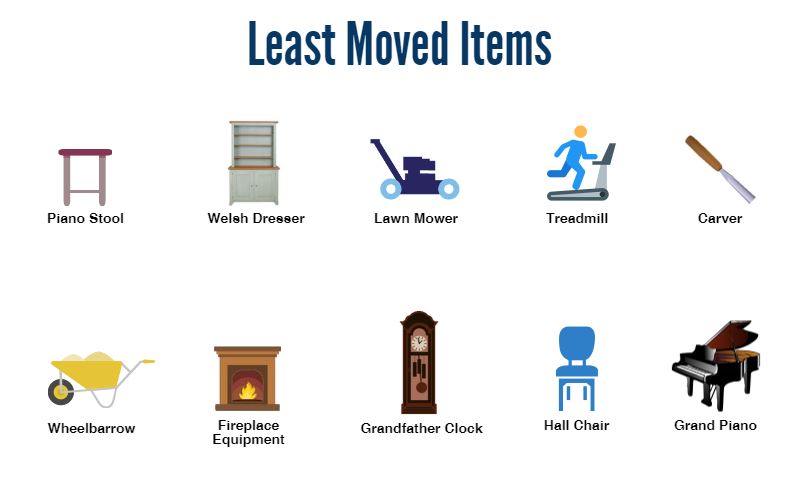 Based on the data we’ve seen, in our top moved items and box sizes, it looks like more people are just not very informed on whether it’s more efficient to but new items rather than ship them. Again, it’s important to do research on the country you’re moving to, and to get quotes from different moving companies to check the prices and compare them with the cost of buying new items in your new country of residence. 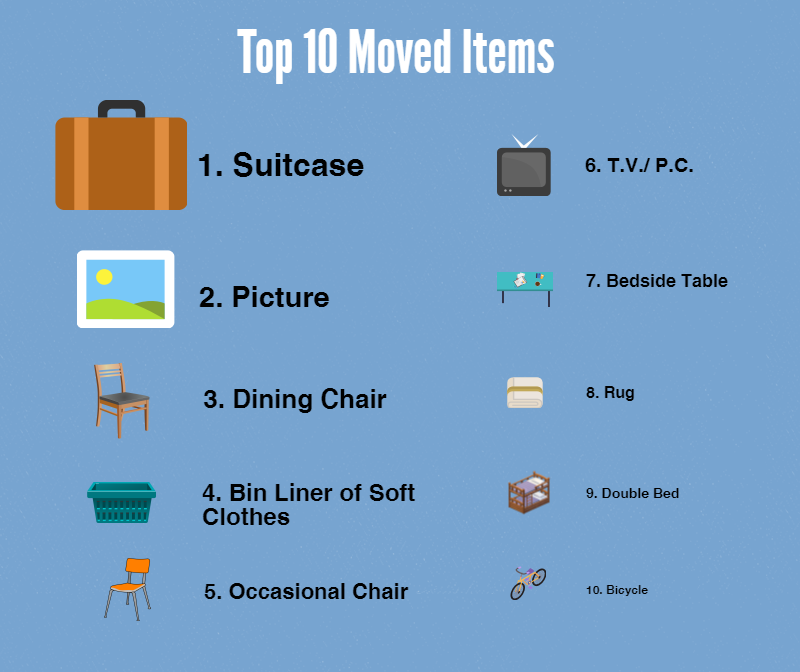 You may need items in your suitcases and boxes, but dining chairs, occasional chairs, and television are items you can most likely find and buy in your new country. Pack essential items you absolutely have to take when you move to avoid hassle and to save some money when you move to a new country.